The death toll from a powerful cyclone that hit India and Bangladesh this week has climbed to at least 180, officials said Wednesday. In Bangladesh, some 111 people have died and more than 6,600 others have been injured in the storm, said Sultanul Islam Chowdhury from the country’s food and disaster management ministry. Cyclone Aila, which made landfall on Monday, has swept away nearly 180,000 homes and affected the lives of more than 3.3 million people, he said. 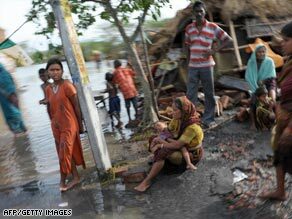 In India, the number of storm-related deaths climbed to 69 Wednesday, according to an emergency official. About a quarter of the total, 20 people, died in landslides triggered by Aila on Tuesday in a hilly region of West Bengal, said Debabrata Pal, a joint-secretary with the state’s disaster management department.